Now that summer is here, with some of the hottest and driest days of the year in Hawaii, it’s a good time to take a second look at our lawns and gardens. The Honolulu Board of Water Supply estimates that 50% of our water consumption is used outdoors, sometimes wastefully. Adding a rain garden, changing our irrigation schedule, or choosing lower-maintenance “unthirsty” plants could help conserve water. Xeriscaping – conserving water through efficient landscaping – is one way that we can save water, as well as save money on our water bills, and keep our yards, sidewalks, and public spaces beautiful. 1. Make a landscaping plan. Good planning and design allows you to install your landscape in phases, which minimizes initial expenses. 2. Limit and separate turf areas. Grassed areas frequently require the greatest amount of watering. Consider replacing or reducing grassed areas with ground covers or mulches. Separate turf grass from trees, shrubs, ground covers, and flowering plants, so that they can be irrigated separately. 3. Have a well-planned sprinkler system.For efficient water use, group garden plants according to similar water needs. Turf areas are best watered with sprinklers. Trees, shrubs, garden flowers and ground covers can be watered efficiently with low volume drip, spray or bubbler emitters. To reduce water waste, water lawns and gardens before 9 am and after 5 pm; and use moisture sensors (devices that shut down the sprinklers when the ground is wet or on rainy days). 4. Make soil improvements. Soil improvements and efficient grading can better absorb and retain water. But do them before installing your irrigation systems! 5. Create mulched planting beds. Mulches cover and cool soil, minimize evaporation, reduce weed growth, and slow erosion. They also create landscape interest, while using less water than turf grass. Organic mulches (such as bark chips, wood grindings or bagasse) and inorganic mulches (such as rock and gravel) should be placed directly on the soil or on breathable fabric. 6. Choose “less thirsty” plants. There are many flowering trees, shrubs, vines, and turf grasses that are both beautiful and require less water. Native Hawaiian plants especially thrive on natural rainfall. 7. Do regular maintenance. Pruning, weeding, proper fertilization, pest control, and adjustments to your irrigation system can further your water savings. If you need inspiration for your garden, stop by the Healthy Watershed Demonstration site at the entrance to Koko Head District Park in East Honolulu (pictured above). The sloping, sunken garden, which filters rainwater and lets it soak into the ground, is surrounded by rocks and native Hawaiian plants. It’s installed and maintained by Mālama Maunalua, a community non-profit organization. Looking for Native Hawaiian plants? Read the “How to Plant a Native Hawaiian Garden” handbook from the Office of Environmental Quality Control. Or check out the Annual Halawa Xeriscape Garden Open House on August 2, 2014 and their Unthirsty Plant Sale. Interested in taking a xeriscaping class? Visit the Honolulu Board of Water Supply for a list of and workshops on Oahu. How do you conserve water? What are the easiest and cheapest ways to cut down on your water bill? In these early days of political campaigning for the 2014 Hawaii elections, I was curious to see which issues our Hawaii candidates chose to focus on – while they can take their time with their message, without the distraction of debates. I decided to take note of the radio and television ads produced by Hawaii candidates running for US Congress and Governor, and write down my first responses to their messages. Note: I’m a nonpartisan voter and I’m not affiliated with any political party. 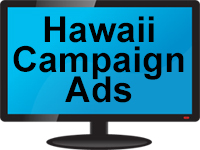 These are the Hawaii TV and radio political ads that broadcast in May 2014, alphabetized by candidate; and my responses to the ads. For those of you who are interested, I’ve included transcripts of the TV and radio ads at the end of the post. Please let me know if I’ve missed a major ad campaign. My response to Abercrombie’s ads: I think there’s nothing wrong with assisted living or down-sizing to a home you can afford and maintain. People belong in their own homes as long as they can take care of themselves; but if they need care, they belong where someone can help care for them. The male narrator’s voice in the radio ad was slightly ominous. Significantly, Abercrombie doesn’t talk about how we’re going to pay for this (and early education too). My response to Aiona’s ad: While the ad tells me about Aiona’s experience as a family judge and establishes him as a family man, it doesn’t tell me what his priorities are or where he stands on important issues. I’d rather know what Aiona accomplished as lieutenant governor and what he wants to accomplish as governor. I also found the music and Aiona’s narration too slow and measured. It felt more like a tribute than a call to support him. My response to Chang’s ad: It’s generic. There’s nothing about his background, accomplishments on the City Council, or qualifications for Congress. Chang seems ambitious and seems to want to please everyone, but all of those all of those projects will cost a lot of money – and except for Social Security, they are state issues. My response to Hanabusa’s ads: Other candidates may have started earlier, but Hanabusa started May off on a strong note. I thought the ads were professional and well-done. But aside from her working-class roots, Social Security is the only accomplishment and priority that she focuses on. I want to know her other accomplishments and priorities in Congress – and why she is giving up her job as US Representative to run for US Senator. * Hawaii Senator Donna Mercado Kim, who is running for US Senate, started May with a TV ad called “Happy Mother’s Day” that focused on her mother, her humble beginnings, and Social Security. “We have an obligation to all seniors in Hawaii. You have my pledge to protect Social Security and Medicare,” she promises. My response to Kim’s ad: I learned that Kim overcame the challenge of being poor to become successful and civic-minded. But I think that she piggy-backed on Mother’s Day to send her message. Her commitment to protecting Social Security makes me ask: do families have an obligation to seniors, or is it government’s responsibility? My response to Schatz’s ad: I’m puzzled; I thought that gun ownership is a states’ rights issue. I like the fact that Schatz tells us his voting record, but I don’t see this as a hot-button issue for Hawaii. The ad seems more like a way to align himself with President Obama (there’s a photo of them together) and introduce his children, than tell us about himself and his priorities. There are five months until the November election. What issues to you think are important? Is there a candidate who has already earned your vote? Here are transcripts of the TV and radio ads. If I’ve made a mistake in any of the transcripts, please let me know. 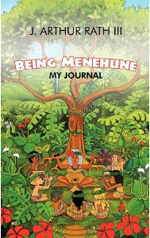 Written in the first person, “Being Menehune: My Journal” (2011) by Arthur J. Rath III is part fantasy and part historical dramatization, blurring the lines between fiction and biography. It’s about being seen, learning that every person has a purpose, learning who you are, connections between people, and the power of books and imagination. In 1942, Arthur, a sickly former foster child who is an avid reader, meets Kahu, his Menehune mentor, and begins writing a journal about his life, his travels into Hawaii’s past, and what he learns. On Menehune Plain, he meets Miki, a leprechaun who speaks in Shakespearian rhyme; Per’fessor, an artist and teacher, and his beautiful wife Aiko; Queen Esther, who tells him about ancient Persia and the power of women; Ah Soong, who cooks and is a caretaker; and Rising Sun, who believes in Japanese superiority. “During the past seven years I’ve learned to associate with those whom others don’t see” (page 12), Arthur writes at the grown-up age of 10. With the help of time travel, magical mango (that help him read people’s thoughts), and invisibility spells, Arthur goes back in time to learn about old Hawaiian warfare, the Polynesian migration, the Menehune retreat from the human world, Hawaiian government and family life, Makahiki, Kamehameha I’s rise to power, and the destruction of the ‘iliahi (sandlewood) forests. “Ah Soong, Miki, Rising Sun, other Menehune, and I are unnoticed in the human world. We watch and hear what goes on,” Kahu says. “Being invisible, Big Persons don’t know we’re present and, of course, don’t realize what we know” (page 43). In his “real” life, Arthur writes about the effects of the Pearl Harbor attack on Japanese Americans, Confirmation, living as a foster child and being exposed to different cultures on the West Coast, interracial families, reading and imaginative play, interacting with solders based at Hospital Hill, being left on his own, and his grandfather’s quiet shame at being Native Hawaiian. The narrative is whimsical, cerebral, and makes Hawaiian history and culture more relevant. Arthur’s adventures bring new life to Hawaiian history and historical figures. The ending feels abrupt and a little sad, with the realization that just as Arthur’s journey was starting, his grandfather’s dreams were ending. Arthur is curious and inventive, absorbs everything, and is surprisingly self-aware and intelligent. Some of his vocabulary and observations are very mature for a 10-year old, and his sophistication sometimes pulled me from the narrative. The book is illustrated with detailed and intricate drawings by Paul Forney. Read Rath’s blog, read more stories about Menehune, and find out more about his books at menehuneRATH.com. I grew up in a multi-generational household. My grandparents owned the home, but my father and aunt lived there and contributed money for utilities and groceries. Living separately, we would not have been able to afford our own homes, take vacations, pay for child care, or own two cars. But living together, my parents and grandparents were able to save money and avoid getting into debt. They helped raise me (no after-school care) and took me on vacations to Disneyland and New York when I got older. Multi-generational households are fairly common in Hawaii. Over 11% of Hawaii households are multigenerational, the largest percentage in the United States, according to 2009-2011 US Census Multigenerational Households report. These households consist of three or more generations. Several of my friends and family members are living with their parents, relatives, or children. Right now, I know of two couples who are rebuilding or renovating their homes so that a child and his family can move in with them. June is National Home Ownership Month, and we’re starting to focus less on single-family home ownership and more on creating homes that suit our needs. Ohana housing, condominiums, and smaller homes are all more attainable and may even be a better fit with Hawaii’s culture and lifestyle. They have the benefits of saving money (in terms of mortgage, utilities, and maintenance) and reducing debt, and take into account childcare and elder care. In the 2014 Hawaii Legislative session, one proposal stood out as a way to help multi-generational households: tax credits for ohana housing. HB1592 and SB2340 would establish a refundable ohana residential housing income tax credit for principal residences between April 2014 and January 2016. No progress has been made on these bills. Note: I don’t support tax credits in general; I would prefer to simplify the tax code and get rid of most tax credits. But I also understand that we have to work with the system we have. * Ohana housing workshops: The Department of Housing and Urban Development or the Hawaii Public Housing Authority could offer periodic workshops to help people decide whether ohana housing is right for them, and help guide them through the process of building, permit approvals, and family considerations (Who will own the land and house? Is this a temporary situation? How will bills, taxes, repairs, and maintenance be proportioned? Who will take care of household responsibilities? How can privacy be respected?). * Ohana home savings accounts: Low-income individuals and families could enter into an agreement to pool their money in a dedicated ohana home savings account. This would be available to two or more related individuals or families (for example, parents, child, and child’s family; or aunt/uncle, niece/nephew, and their family). The money could be used only for housing – first and last month’s rent plus a deposit for a rental unit, or a down-payment on a home – with the account holders named on the lease or title. There would be a five-year deadline for making a withdrawal. Have you lived in a multi-generational home? If yes, what has been your experience? What are the biggest rewards and challenges? If not, what concerns you and what would make you consider it? You are currently browsing the Better Hawaii weblog archives for June 2014.